It all started in 1173. The original two levels of the Tower of Pisa didn’t lean but the structure began to slant when construction moved to the third level and beyond in 1178. Various solutions were tried once the architect took notice of the lean in 1185, determining that the soil at the chosen site was too unstable to support such a large structure. The construction of the Tower of Pisa stopped for nearly a century because of Pisa's wars with the neighboring city of Florence. Work started again in 1272 and four floors were built in an altered angle to the previous levels, but the Leaning Tower of Pisa started to lean in the direction of the taller side. In 1284 construction stopped again because Pisa was conquered by Genoa in another war. In 1370 the tower, now eight stories and 200 feet high, was officially completed. Experts have been divided over whether the lean was an effect designed by the architects, or if the lean was a result of structural issues relating to the soil at the base of the tower. However, tests during the 20th century have conclusively proven that the inclination began after the construction. The study of the subsoil revealed an inter-layered clay-type material washed by subterranean waters. The foundation for the Tower of Pisa was laid in 1173, constructed mainly of marble and lime; the tower was built in a circular ditch, about five feet deep, over ground consisting of clay, fine sand, and shells. The cause of the lean is due to a reaction of the composite of clay, fine sand, and shells that the tower is built on. This soil mix is more compressible on the south side, but over the years as the tilt increased, the Tower of Pisa stopped sinking and began to rotate, causing the north side to move up toward the surface. 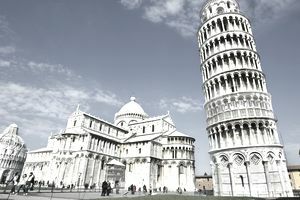 The Tower of Pisa's structure was subject to two main risks: structural failure of the fragile masonry, and collapse due to the breaking up of the subsoil around the foundations. A recent possible solution involved leading by installing a counterweight of about 660 tons on the north side of the tower's base in order to stop rotation. It failed. Then, during 1995, freezing of the inserting steel cables and freezing of the subsoil was attempted, but this caused the lean to increase. Later on, scientists and engineers detected that soil extraction was the key to bringing the tilt back to stable conditions. Soil was extracted from two layers of earth: the top layer of sandy soil and the second of marine clay. The theory was that while the soil was being removed, the ground compression would surge and the clay would consolidate, providing a stronger foundation. The drills extracted soil from inside a casing without acting upon other elements or outside of it. The drill cavity then closes smoothly when the drill is retracted and the soil settles, forming a cradle that cushions the tower as it shifts slightly to the north. By using this method, engineers have reduced the lean back toward the center by 20 inches, back to where it was in 1838. The top of the tower now leans just over 13 feet off center. When building over soft soils, it may be necessary to excavate down past the soft spot and place a deeper footing. Replace the soft soil with adequate soil that will produce the bearing capacity specified in the design. Build a bigger footing and reinforce it with additional steel (in concrete footings). Use friction piling or end load bearing piling if the soil type below is suitable. Flood the ground once the trenches have been dug and then compact thoroughly. This common practice improves cohesion and makes the soil considerably more stable to build on. Inject a soil/cement slurry. This process requires four key pieces of equipment: a drill rig to advance the slurry to design depth, a batch plant or tank to mix the cement slurry, a pump to push the slurry to the drill rig, and specialized tooling to blend the cement slurry with soil in situ. Use geogrids to provide an effective mean for reducing pressure below traffic surface. Each project is unique and will require a different combination of techniques depending on the type of materials being used, the type of structure, and the specific soil conditions in each case. Keep in mind that the required regulations and codes must be met in every condition.